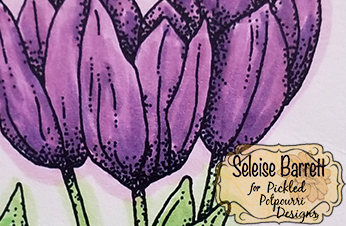 It's been cold, cold, cold here in Kansas and I'm dreaming of Spring so I decided to bring Spring alive in this month's post. Tulips are the perfect Spring flower (along with iris!). They're cheery and easy and vibrant and they just make me happy! I simply adore the Milk Can Flowers digi set. I have a hard time lining up two part rubber stamp sets, even with the stamp platforms. With digis, I can line them up and fuss with them until I have it just right and then print. It's so easy and so fun! The image is colored with copics and popped up on an embossed background. This makes a perfect note card, get well card, birthday card or sympathy card. By having a focal image and no sentiment, the possibilities are endless. 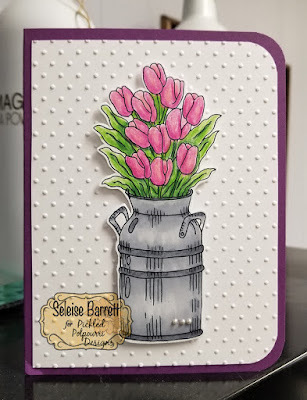 And, here's another tulip card featuring the Tulip digi. It's also colored in copics and is layered on a splashed background stitched cardstock layer and then on a polka dot background. It's another card design without a sentiment so the image can pop. I normally outline an image in light blueish green to make it pop a little. 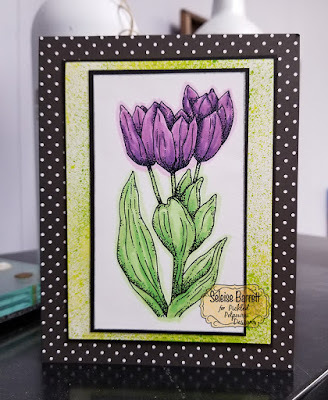 This one I experimented with a light lavender around the flower and a light green around the leaves. The fun of coloring is that there are always options.